Germantown, Maryland-based continuous glucose monitor device maker Senseonics raised $10 million, according to an SEC filing. The company has not yet responded to a request for comment. Existing investors include Anthem Capital, Delphi Ventures, Greenspring Associates, Healthcare Ventures, and New Enterprise Associates. This brings the company’s total funding to at least $94 million to date. Senseonics’ pill-like sensor is entirely implanted in the user’s upper arm so that it can continuously monitor the user’s glucose levels. The device is meant to last at least 90 days before it needs to be replaced. 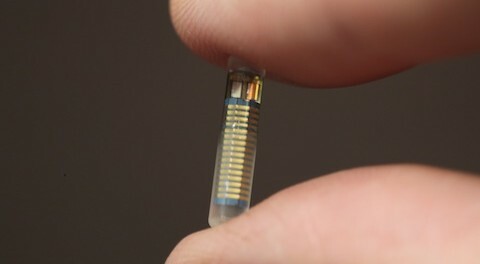 The sensor sends data to a transmitter that a users wears on their upper arm as well. When on the user’s upper arm, the transmitter can take readings from the implanted sensor and send them to a companion smartphone app. The transmitter can also connect to the user’s computer via USB to upload glucose history. When Senseonics raised its previous round in June 2014, the company said it would use the funds to obtain a CE mark and start investigational device exemption (IDE) trials in the US. Completing an IDE trial allows the company to use the device in a clinical study to collect safety and effectiveness data, according to the FDA. In May, Senseonics partnered with Sweden-based Rubin Medical, an insulin pump distributor, to commercialize Senseonics’ CGM in Scandinavia. The partnership involves an exclusive distribution agreement of the Senseonics’ CGM system in Sweden, Norway, and Denmark. At the time of the announcement, Senseonics said they expect to have a CE mark for the product before the end of this year. Another continuous glucose monitoring company, DexCom, has also been working on releasing a smartphone-connected CGM offering. In October 2014, DexCom Share, a cradle device that will allow users to send data from a DexCom continuous glucose monitor to multiple smartphones,received 510(k) clearance from the FDA. But while Senseonics’ device is implantable, DexCom EVP of Strategy and Product Development Steve Pacelli said recently that five years from now the company aims to develop a device that’s miniaturized, looks more like a bandage than a medical device, and that’s fully disposable.